Jack’s been through a lot. His Dad walked out and never came back when he was eight years old. Then there was the serious bullying that went down at school. Jack’s new family, including sort-of-step-dad Rob took a lot of getting used to as well. Then, as Mum’s wedding day finally drew near, everything went out of control. Now, in Being Jack, life seems to be settling. Grade six is okay. The kids at school who used to bully Jack leave him alone and Mum is recovering well. Step-dad Rob is a funky surfing dude with a sense of humour, but he’s not Jack’s real dad. Jack finds his longing for answers grows until he can’t ignore questions about his real dad any longer. Then things go wrong for Jack’s best friend, Christopher. Is it possible to overcome the odds and find a dad who doesn’t want to be found? What sort of courage does it take to face old enemies to support a friend? Will the old troubles return if Jack tries to interfere? And where is the line between right and wrong if you didn’t do anything wrong yourself? 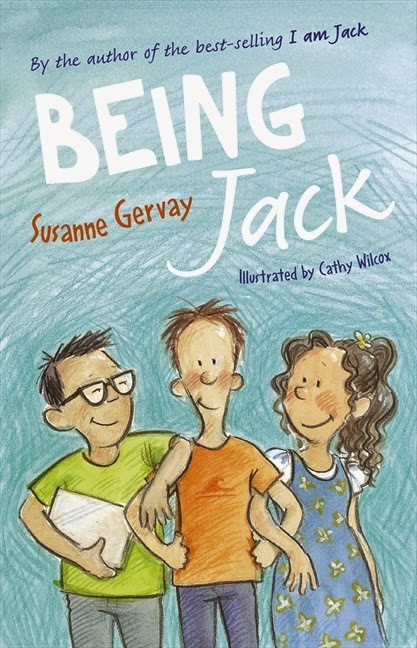 Suzanne Gervay’s Jack is always full of heart. We, as readers, get to know Jack so well from the inside that we share his dilemmas and worries. It’s hard not to feel involved as Jack tries to work out the best thing to do. Being Jack is the perfect conclusion to a heartfelt series: another keeper for Middle Primary students.